On first look, the Chromium-based Microsoft Edge browser reportedly works pretty well on Windows 10, and even includes extensive plugin support. Microsoft has released the first publicly available build of the Chromium-based Edge browser that it was working on for a while. The browser is based on the open source Chromium platform, and attempts to include some of the best features of Chrome while integrating Microsoft’s own design language. Right now, early beta builds have been made available in Developer and Canary forms, of which the Developer build offers a few less features but is more stable, while the Canary build throws in more features but is a less stable build. Microsoft has also announced a more stable Beta build, which will be updated every six weeks, although that has not been rolled out yet. The new browser, as per screenshots shared in reports across the internet, closely resembles the Chrome browser’s home page, with the tabs and recently accessed websites section looking close to Chrome’s essential layout. However, Microsoft has extensively customised the Settings section, which now looks closer to Microsoft’s overall design language with Windows 10. The company has also confirmed that while Windows 10 will be the obvious candidate for receiving the browser first, there is no need to be a part of the Windows 10 Insider programme to be able to download the early builds. Furthermore, the Chromium-based Edge browser will be rolled out to Windows 8, 8.1 and Windows 7, as well as macOS, in the coming days. As of now, however, interested users can only download it on their Windows 10 devices, and check out how it functions. Reports state that the initial build appears to work quite well and fast on Windows 10, and even goes so far to state that it even works smoother than Chrome, which will be encouraging for Microsoft. The Redmond-based technology giant has been focusing on its services offerings for a while, with CEO Satya Nadella turning around the company’s financial performance based on strong but solid work around offer a wide range of services. Microsoft’s latest ploy to maximise revenue generation involves speeding up cross platform services offerings to users that have deviated from its ecosystem, and the Chromium-based revamp of the Edge browser is definite proof of its intent. 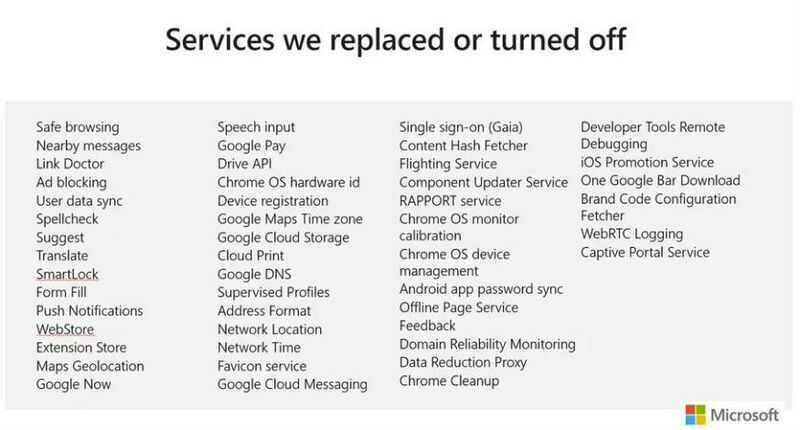 The company has also published a full list of features that they have replaced or removed from Chrome, which you can see in the image above.